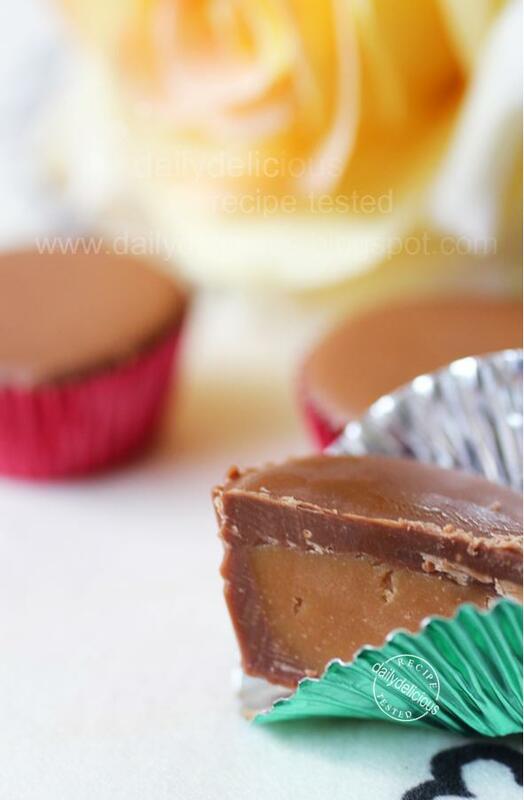 dailydelicious: Peanut Butter Bombs: Little cups of happiness! I'm not gonna say that I made some adaptation to lower sugar or fat ^^, because now we talk about real food, real chocolate! I always love them the way it is, so you rarely see me using any low fat ingredient in my recipe, I believe that we can still enjoy them in their natural form, the only key is moderation. 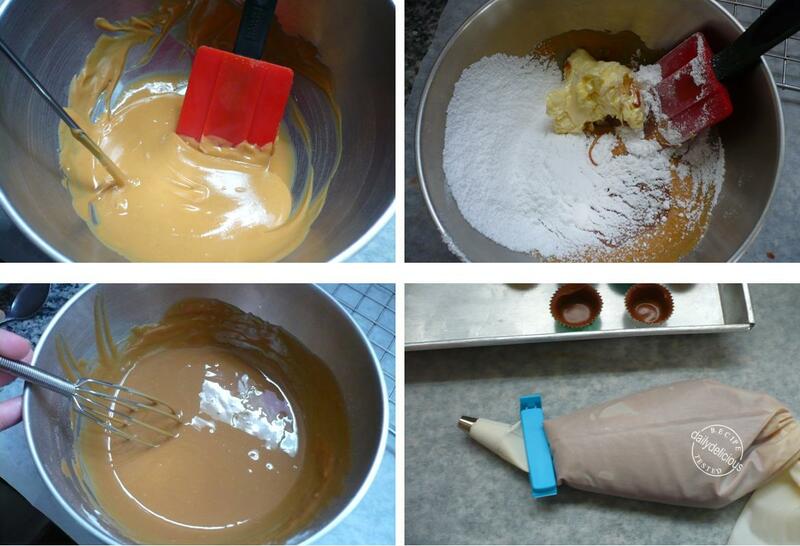 This time, after reading the book, ...................I really want to make it, The Peanut Butter Bombs. Because if you love to eat peanut butter like me, haha, you will find this one is a heaven in a little cup. 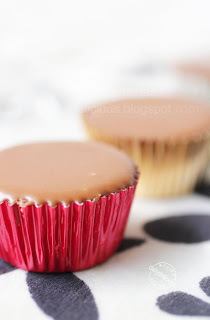 The filling is full of peanut butter that truly comforting, and for the outside this time I make it for all the people in my family (including kid), so I use the milk chocolate. But if you love more bitter taste (from the cocoa mass), you can use dark chocolate and I think that if I make it again I will use 60% or more ^^, because I love dark chocolate too. It's an alternative to traditional tempering techniques, it's easier and very good if you want to temper small amount of the chocolate. But you have to realize that microwaves are different, don't rush the process, only 30 seconds and stir it then heat again, so the chocolate won't melt too quickly and becoming too hot. I choose to use foil cups, the reason? Well I bought them a long time ago and I don't have a chance to use it, haha. So if you don't have a foil cup you still can make this bomb, just use the chocolate molds and follow the method (I add the method for using mold in the recipe too). And if you want to use the dark chocolate, when tempering just follow the method but the finished temperature will be 31°C. 1. Place two thirds of the amount of chocolate that you are going to temper into a bowl; the third will be used later in the tempering process. You will need to use a microwavable plastic bowl as porcelain will become too hot. 2. Place the bowl into the microwave ad heat for 30 seconds on half power. Stir the chocolate and then return it to the microwave for another 30 seconds. Repeat this as many times as required until the chocolate has melted. Don’t be tempted to rush this stage of the process as the chocolate may burn if heated too long. 3. You will notice that the chocolate will start to melt slowly. When the chocolate has melted completely it should be around 45°C. 4. Add the remaining third of the chocolate to the melted chocolate and stir gently (don’t over-stir the chocolate). The cold chocolate will melt into the warm chocolate, lowering the temperature slightly. 5. The chocolate will become thicker and the cool chocolate may not melt completely. If this is the case, use a hairdryer or heat gun to slowly melt the chocolate, stirring at the same time. Take care not to overheat the chocolate. Just before all the chocolate has melted stop heating it and let it finish melting by itself. 6. 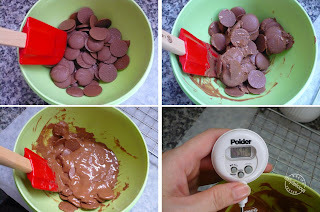 Test the temperature of the chocolate to make sure you have tempered it correctly. If you have a thermometer the temperatures should be 29°C. Note: If the chocolate is too hot, more cool chocolate needs to be added in order to cool it down. When you are working with the tempered chocolate it may begin to cool and thicken. 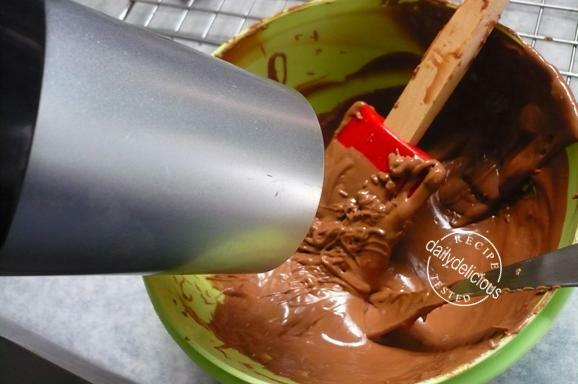 Use the hairdryer or heat gun again to heat the chocolate just a little. Check the temperature as before with the thermometer or palette knife. Spoon or pipe the tempered chocolate into the foil cups (I fill 5 at a time), fill the cups to 1/16 inch of the tops. Invert each cup to remove the excess chocolate from the cup. Shake them lightly to remove the chocolate. Place the cups upside down on a screen. Allow the excess chocolate to drain. Remove each cup from the screen, You must pick up the cups before the chocolate sets (about 4-5 minutes). 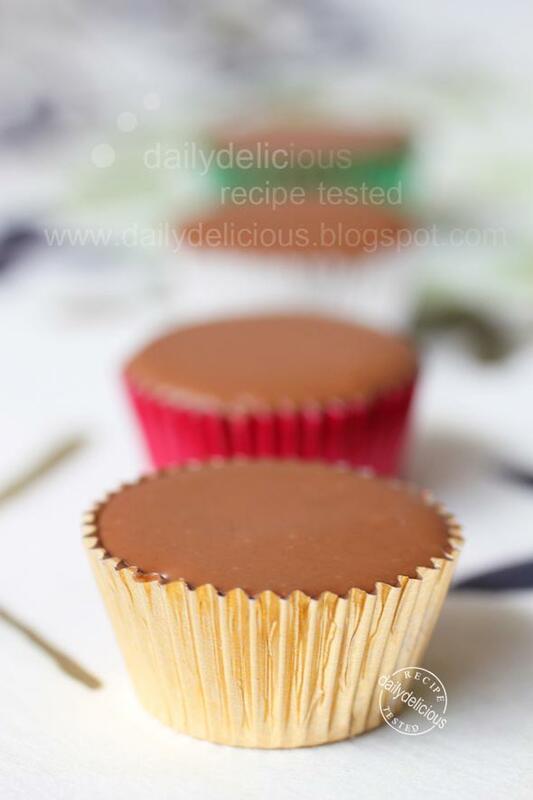 Place the lined cups upright and allow the chocolate to set. Warm the peanut butter to 85°F over a hot water bath. Stir in the sifted icing sugar, butter, salt and melted chocolate. 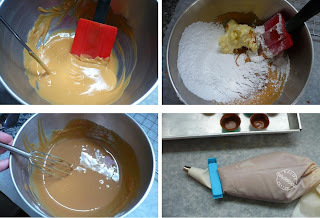 Mix to combine, then transfer to a piping bag with a small opening cut at the tip of the bag. Pipe the filling into the foil cups (or prepared molds) to within ⅛ inch of the top. If necessary, tap the mold on the table to flatten the filling. Refrigerate the molds for 20 minutes to allow the filling to firm. 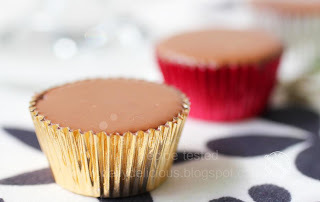 Seal the foil cups (or prepared molds) with the tempered chocolate. 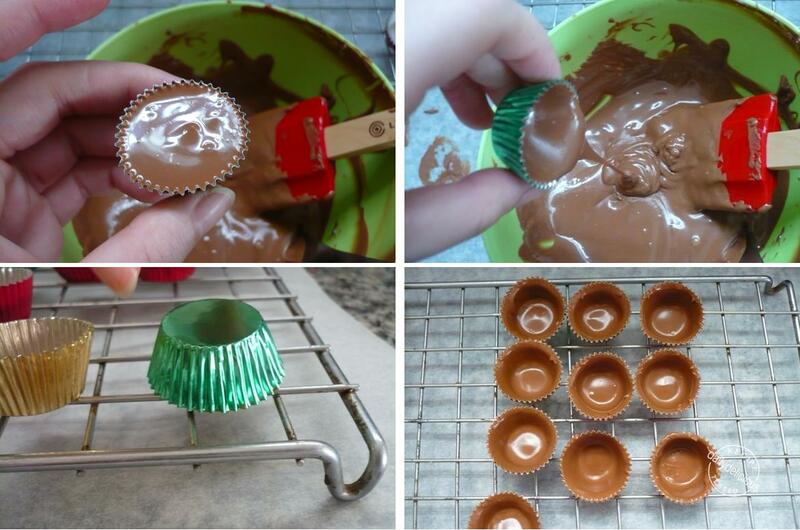 Allow the foil cups (or prepared molds) at room temperature for 20 minutes. If using the foil cups you can let it firm up in room temperature if the temperature is not hot. But if you use the molds refrigerate for 20 minutes and remove the finished chocolate from the mold. omg. i am so making these! thanks so much for sharing the step by step instructions! This is perfect! I have always loved peanut butter so much. These cupcakes make me crave for some peanut butter. 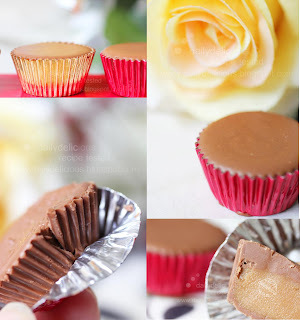 The homemade peanut butter cups look absolutely gorgeous Pook! You never cease to amaze me!